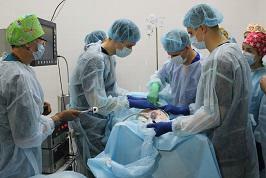 The surgery on an animal was performed on June 8th in the WETLAB training operating room. 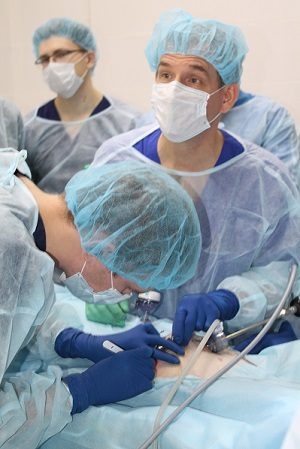 This surgery was an important step for second year residents to practise their skills. Surgeons managed to perform the surgery in an hour and a half instead of planned two hours and a half. The tracheal resection was performed by thoracic surgical residents Nikita KOROTKOV and Stanislav VINTS along with Head of the General Surgery Department, MD, PhD, Prof. Mikhail KORZHUK. The “patient” was a laboratory mini-pig. Second year resident Nikita KOROTKOV has admitted that they really do not have enough practical skills for performing tracheal resection but when they are supported by experienced colleagues, there is no point in being nervous. As a result of the performed surgery residents passed a test and were highly appraised by their senior colleagues. Operations in WETLAB will be performed on a regular basis. This modern training center has proved to be an excellent venue for beginning and practicing surgeons.